You acknowledge and agree that any contributions originally created by you for us shall be deemed a “work made for hire” when the work performed is within the scope of the definition of a work made for hire in Section 101 of the United States Copyright Law, as amended. As such, the copyrights in those works shall belong to 360PILATES, BODYWEIGHT PILATES from their creation. Thus, 360PILATES, BODYWEIGHT PILATES shall be deemed the author and exclusive owner thereof and shall have the right to exploit any or all of the results and proceeds in any and all media, now known or hereafter devised, throughout the universe, in perpetuity, in all languages, as 360PILATES, BODYWEIGHT PILATES determines. In the event that any of the results and proceeds of your submissions hereunder are not deemed a “work made for hire” under Section 101 of the Copyright Act, as amended, you hereby, without additional compensation, irrevocably assign, convey and transfer to 360PILATES, BODYWEIGHT PILATES all proprietary rights, including without limitation, all copyrights and trademarks throughout the universe, in perpetuity in every medium, whether now known or hereafter devised, to such material and any and all right, title and interest in and to all such proprietary rights in every medium, whether now known or hereafter devised, throughout the universe, in perpetuity. Any posted material which are reproductions of prior works by you shall be co-owned by us. You acknowledge that 360PILATES, BODYWEIGHT PILATES has the right but not the obligation to use and display any postings or contributions of any kind and that 360PILATES, BODYWEIGHT PILATES may elect to cease the use and display of any such materials (or any portion thereof), at any time for any reason whatsoever. If applicable, any opinions, advice, statements, services, offers, or other information or content expressed or made available by third parties, including information providers, are those of the respective authors or distributors, and not 360PILATES, BODYWEIGHT PILATES. Neither 360PILATES, BODYWEIGHT PILATES nor any third-party provider of information guarantees the accuracy, completeness, or usefulness of any content. Furthermore, 360PILATES, BODYWEIGHT PILATES neither endorses nor is responsible for the accuracy and reliability of any opinion, advice, or statement made on any of the Sites by anyone other than an authorized 360PILATES, BODYWEIGHT PILATES representative while acting in his/her official capacity. THE INFORMATION, PRODUCTS AND SERVICES OFFERED ON OR THROUGH THE SITE AND BY 360PILATES, BODYWEIGHT PILATES AND ANY THIRD-PARTY SITES ARE PROVIDED “AS IS” AND WITHOUT WARRANTIES OF ANY KIND EITHER EXPRESS OR IMPLIED. TO THE FULLEST EXTENT PERMISSIBLE PURSUANT TO APPLICABLE LAW, WE DISCLAIM ALL WARRANTIES, EXPRESS OR IMPLIED, INCLUDING, BUT NOT LIMITED TO, IMPLIED WARRANTIES OF MERCHANTABILITY AND FITNESS FOR A PARTICULAR PURPOSE. WE DO NOT WARRANT THAT THE SITE OR ANY OF ITS FUNCTIONS WILL BE UNINTERRUPTED OR ERROR-FREE, THAT DEFECTS WILL BE CORRECTED, OR THAT ANY PART OF THIS SITE, INCLUDING BULLETIN BOARDS, OR THE SERVERS THAT MAKE IT AVAILABLE, ARE FREE OF VIRUSES OR OTHER HARMFUL COMPONENTS. You agree at all times to defend, indemnify and hold harmless 360PILATES, BODYWEIGHT PILATES its affiliates, their successors, transferees, assignees and licensees and their respective parent and subsidiary companies, agents, associates, officers, directors, shareholders and employees of each from and against any and all claims, causes of action, damages, liabilities, costs and expenses, including legal fees and expenses, arising out of or related to your breach of any obligation, warranty, representation or covenant set forth herein. Your participation, correspondence or business dealings with any third party found on or through our Site, regarding payment and delivery of specific goods and services, and any other terms, conditions, representations or warranties associated with such dealings, are solely between you and such third party. You agree that 360PILATES, BODYWEIGHT PILATES shall not be responsible or liable for any loss, damage, or other matters of any sort incurred as the result of such dealings. *Restrict or inhibit any other user from using and enjoying the Site. *Use the Site to impersonate any person or entity, or falsely state or otherwise misrepresent your affiliation with a person or entity. *Interfere with or disrupt any servers or networks used to provide the Site or its features, or disobey any requirements, procedures, policies or regulations of the networks we use to provide the Site. *Use the Site to instigate or encourage others to commit illegal activities or cause injury or property damage to any person. *Obtain or attempt to obtain any materials or information through any means not intentionally made available through this Site. *Use the Site to post or transmit any unlawful, threatening, abusive, libelous, defamatory, obscene, vulgar, pornographic, profane or indecent information of any kind, including without limitation any transmissions constituting or encouraging conduct that would constitute a criminal offense, give rise to civil liability or otherwise violate any local, state, national or international law. *Use the Site to post or transmit any information, software or other material that violates or infringes upon the rights of others, including material that is an invasion of privacy or publicity rights or that is protected by copyright, trademark or other proprietary right, or derivative works with respect thereto, without first obtaining permission from the owner or rights holder. *Use the Site to post or transmit any information, software or other material that contains a virus or other harmful component. *Use the Site to post, transmit or in any way exploit any information, software or other material for commercial purposes, or that contains advertising. *Use the Site to advertise or solicit to anyone to buy or sell products or services, or to make donations of any kind, without our express written approval. *Gather for marketing purposes any email addresses or other personal information that has been posted by other users of the Site. 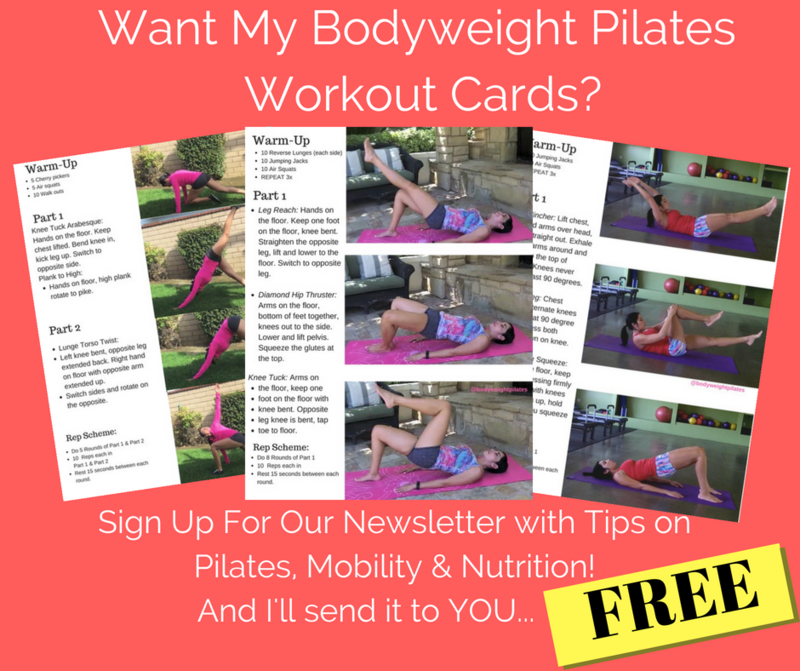 360PILATES, BODYWEIGHT PILATES may host message boards, chats and other private/public forums on its Sites and on other platforms. Any user failing to comply with the terms and conditions of this Agreement may be expelled from and refused continued access to, the message boards, groups, chats or other such forums in the future. 360PILATES, BODYWEIGHT PILATES or its designated agents may remove or alter any user-created content at any time for any reason. Message boards, chats and other public forums are intended to serve as discussion centers for users and subscribers. Information and content posted within these public forums may be provided by 360PILATES, BODYWEIGHT PILATES staff, 360PILATES, BODYWEIGHT PILATES’s outside contributors, or by users not connected with 360PILATES, BODYWEIGHT PILATES, some of whom may employ anonymous user names. 360PILATES, BODYWEIGHT PILATES expressly disclaims all responsibility and endorsement and makes no representation as to the validity of any opinion, advice, information or statement made or displayed in these forums by third parties, nor are we responsible for any errors or omissions in such postings, or for hyperlinks embedded in any messages. Under no circumstances will we, our affiliates, suppliers or agents be liable for any loss or damage caused by your reliance on information obtained through these forums. The opinions expressed in these forums are solely the opinions of the participants, and do not reflect the opinions of 360PILATES, BODYWEIGHT PILATES or any of its subsidiaries or affiliates. 360PILATES, BODYWEIGHT PILATES has no obligation whatsoever to monitor any of the content or postings on the message boards, chat rooms or other public forums on the Sites. However, you acknowledge and agree that we have the absolute right to monitor the same at our sole discretion. In addition, we reserve the right to alter, edit, refuse to post or remove any postings or content, in whole or in part, for any reason and to disclose such materials and the circumstances surrounding their transmission to any third party in order to satisfy any applicable law, regulation, legal process or governmental request and to protect ourselves, our clients, sponsors, users and visitors. 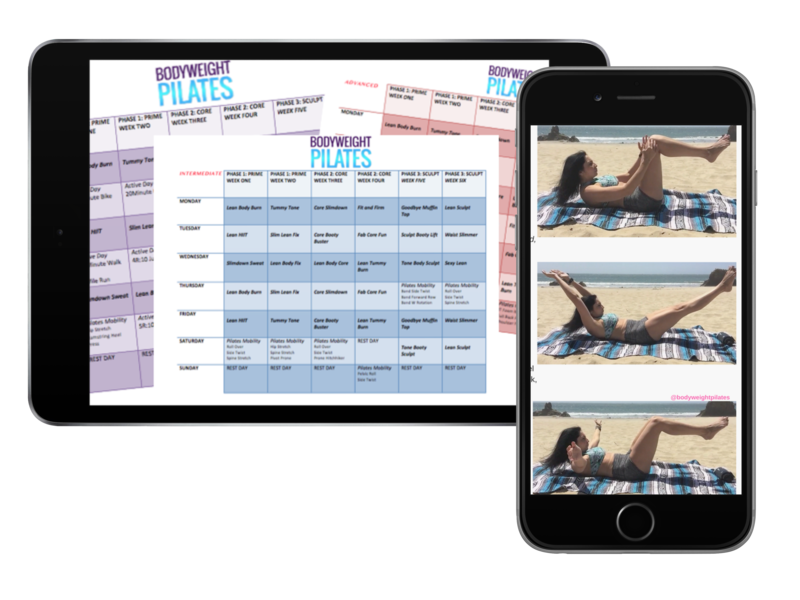 THIS SITE IS CONTINUALLY UNDER DEVELOPMENT AND 360PILATES, BODYWEIGHT PILATES MAKES NO WARRANTY OF ANY KIND, IMPLIED OR EXPRESS, AS TO ITS ACCURACY, COMPLETENESS OR APPROPRIATENESS FOR ANY PURPOSE. This Agreement shall be binding upon and inure to the benefit of 360PILATES, BODYWEIGHT PILATES and our respective assigns, successors, heirs, and legal representatives. Neither this Agreement nor any rights hereunder may be assigned without the prior written consent of 360PILATES, BODYWEIGHT PILATES Notwithstanding the foregoing, all rights and obligations under this Agreement may be freely assigned by 360PILATES, BODYWEIGHT PILATES to any affiliated entity or any of its wholly owned subsidiaries.